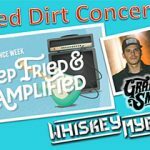 Nebraska State Fair AND Y102 are proud to present FOUR awesome Red Dirt Artists at this year’s 150th Fairabration!As heard this AM on The ScottyO Show! BUY the bundle for just $79 reserved and $129 PIT for ALL three shows! That’s $26 a show with gate admission included!